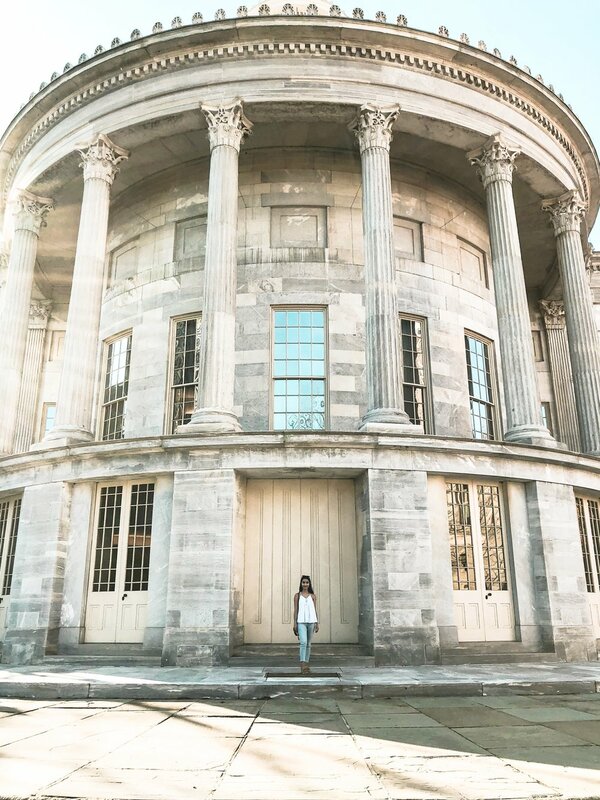 March Music Favorites 2018 — Christine Celine. 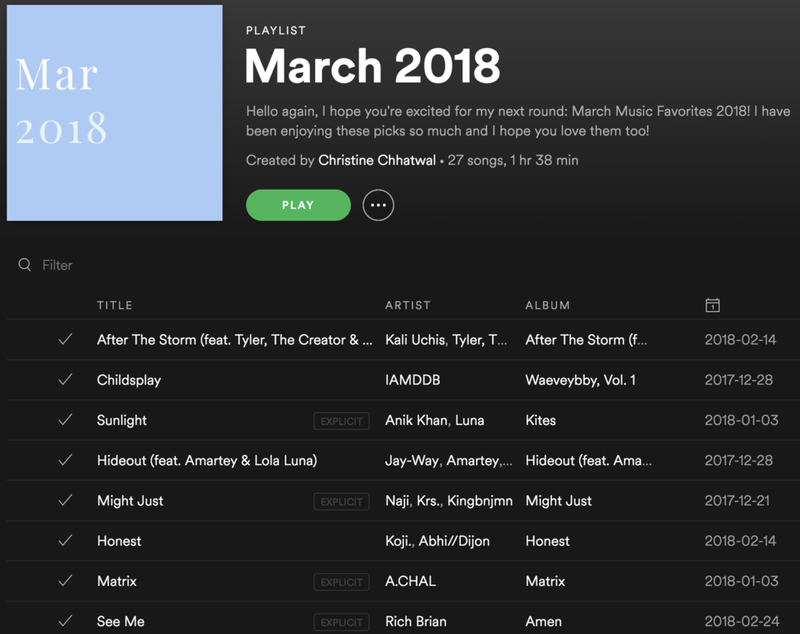 Hello again, I hope you're excited for my next round: March Music Favorites 2018! I have been enjoying these picks so much and I hope you love them too! Let's march on as there are a ton of songs to cover! Remember to follow the playlists on Spotify for quick access or YouTube if you prefer! Remember you can follow me on Spotify for new playlists every month! I love Kali on this number. Her voice is sultry and this song always puts me in a good mood. I can't wait for her new album in April. This song reminds me of some South Asian elements and I absolutely love the lyrics in this song. Another South Asian inspired jam. I really like the fusion between Anik's heritage and his hometown. It's a really catchy song that flows easily from the previous one. This song has be on loop. There are so many great moments and I love the section at 2:08-2:45 before the hook. You know that you cute. This song was featured recently by Soulection and I really enjoy the moody backbone of this song. This has been such a fun song when I am driving to class. I just love how it picks up at 0:41. Abhi//Dijon are becoming one of my favorite duos and I can't wait to hear more from them. Red and blue pills, black shades. That's the basics. This song is one of my favorites from A.CHAL. I can always kick back and chill with this song. Only 90's kids will remember Rich Chigga. (I saw this on a comment on his music video and couldn't stop laughing.) As an OG fan, I don't always remember to call him Rich Brian but Amen is a solid album and he really deserves more recognition compared to some rappers these days. I really love the lyrics on this one Riz. I feel like this song reflects those nights filled with good times and even better memories. This song is perfect for any road trips. I love Ari's voice and she can put anything on DJ Grumble's beats and I'll be a fan. I took a little longer to really like this song but it kept coming up on the radio settings and it grew on me. Sometimes, you just gotta remember to chill out. This is another good song for a road trip and always gets me in a happy mood. I prefer the Acoustic Version a lot more because I love me some slow jams. This is such a good song. I love the transition from Know to Vibes at around 3:00. If I had to pick a song that got me in a good mood and ready to dance this month, it would be Keep On. I love the old school vibes this gives me and it's a bop as they say these days. This was a great find and I really enjoy Mahalia's voice. Trust me, she's great. I am so happy I found Raveena. She's a gem and I am so in love with her spirit. It's not often I see an Indian-American represented in the music I listen to and her album Shanti makes me so happy. Also her colors performance is so cute and I love her voice. I'm excited for spring and summer and I can't wait to go to the beach and eat some gelato. This song is really chill and great to put on while you get some work done. Another Naji favorite. It's a little more upbeat and funky. My favorite kind of Soulection beats. I didn't like this song at first but then I gave it another listen and I was hooked. SG Lewis makes some really catchy beats. A good reminder to eat more veggies, drink more water and take care of myself. I really relate with the lyrics especially this month. I always take on too much and put myself last which isn't the motion. Here's to making more time for ourselves and what matters. The genius annotations made me realize that this song is kind of somber. I do enjoy it though and sometimes sad songs are necessary. The artistry of the song is amazing because it is a battle of a man's thoughts represented through the two voices. I love the lyrics to this song. I think it's always easier to throw in the towel but some things get better after those ups and downs. It makes your bond stronger and that much more worth it. I am trying to explore some of the genres I love but recently have been neglecting. This song made me really happy for some reason when I found it. This song is so interesting because there is no chorus/hook. It just winds around until the end with some interesting quirks. I love the piano in the background. This song is an oldie but a goodie. I just remembered it and was feeling it this month. I love the remix that Joe Kay did at his show this month but I think that the original is really nice too. I haven't heard this song in so long but I have been going back to it recently for some reason. I love this song and how catchy it is. Whew! These write-ups have gotten longer and longer now that I stopped capping the playlists at seven songs. I think each month is progressively getting longer. I decided for the rest of the year, I would publish the playlists at the beginning of the month so my April Music Favorites will be up pretty soon. So now you have 60+ songs to enjoy from yours truly. As always be sure to comment down below which song is your favorite or any song suggestions as I would love to incorporate them in the upcoming months.